Princess Caroline Mathilde (Alicia Vikander) has just married King Christian VII (Mikkel Boe Folsgaard), and what should be wedded bliss is disturbed by an unhappy pairing. Caroline is full of life and passionate about literature and the arts. Her husband is mentally ill, and she finds her new life does not allow her to be the woman she’d like to be. Soon she is pregnant with her first son. A German doctor is hired to help the King. His name is Johann Friedrich Struensee and Caroline takes a liking to him. As a man of the Enlightenment, he appreciates literature as Caroline does. The King is also a fan of Struensee and as their friendship grows, so does his relationship with Caroline. Soon, the two start a clandestine affair. They are able to keep the relationship a secret, but when she becomes pregnant with Struensee’s child they risk the truth coming out. They devise a plan to convince Christian to continue sleeping with Caroline so they can tell him the child is his. Life continues on without any major disruptions and their secret is kept between them. Struensee begins to gain more and more respect in the community and is granted political influence by the King. But when Caroline and Struensee are caught together and their affair is announced, will it all be for nothing? Will all their political advancements go to waste? 11.5.2014 Teoretik inserted real photo of the filming location Carriage rides of the Movie A Royal Affair. 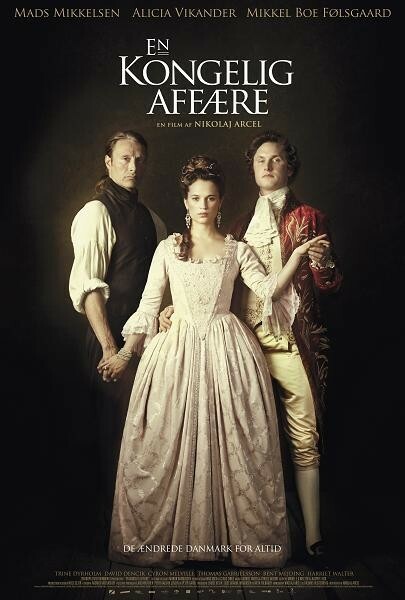 21.4.2014 Jessica2014 inserted storyline of the Movie A Royal Affair. 17.3.2013 yurasch inserted real photo of the filming location Carriage rides of the Movie A Royal Affair. 5.3.2013 yurasch inserted filming location Night Arrival of the Movie A Royal Affair. 5.3.2013 yurasch inserted filming location Carriage rides of the Movie A Royal Affair.